Originally Released 10th June 2003. Review not previously published. I have to admit, I was expecting another dose of wily nerd-pop, a pale East Coast homage to Weezer and other such mock-my-inadequacy formula US college rock outfits. FOW’s previous work had been both earnest and melodic in equal measure and the raw songwriting materials necessary to go further were clearly there, but their back catalogue barely hinted at the coming of age that was Welcome Interstate Managers. It was the nicest of surprises. Ignore the American Pie teenage crush goofery of the (Hopefully) very ironic hit single “Stacy’s Mom”, but if you rightly hated it at the time and wrongly dismissed FOW as nip-slip slobbering jerkoffs, think again. Lead protagonists Chris Collingwood and Adam Schlesinger created a dazzling thatched quilt of an album from numerous influences, taking The Beach Boys and Simon and Garfunkel and mastering the trick of being a tribute band to the sixties rather than a sixties tribute band. The backdrop is New York, as with so many other albums, lovingly depicted, but the dozen plus vignettes on “Welcome…” are co-dependent with the city’s schizophrenic spirit, part cocksure, part run through with insecurity, neuroses and an overwhelming desire to be loved. Schlesinger battles with the insane contrasts of modern living and it’s soul-hawking insanity (Bright Future in Sales) and the Mcjob (Hey Julie) but he’s far more at home amongst the blue collar mundanity of just getting by day to day, as on the achingly gorgeous Hackensack and the coming of age ballad All Kinds of Time. There’s even a place for an archly sarcastic country and western pastiche Hung Up On You on which you sense tongues were so firmly in cheek that they had to be surgically removed afterwards. True, such is the ambition on show that they do occasionally meet themselves coming back the other way, such as on the almost self parodying Peace and Love and Oasis out-take Bought For A Song, but the penultimate Supercollider is a blast, poking fun at the lyrical excesses of psychedelia whilst channeling Spinal Tap, whilst Yours and Mine is a swift and satisfying end. 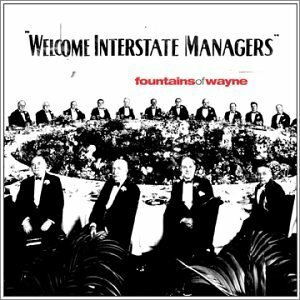 Welcome… is a fine, fine record, and on realising Stacey’s Mom was it’s Trojan horse, your neighbourhood jocks will probably have their copy for sale on Ebay for 50 cents. Time to hit those yard sales.